Call it what you want, fashion or costume, jewellery for the summer should always be fun. In the summer, beachwear influences our daily wear so that colour, size and texture abound and we tend to go brighter and bigger. Very often, when a trend is introduced in the spring, it appears bolder in the summer and then evolves through the fall and winter. The following spring another trend will appear and develop in more or less the same way. The following five 2012 jewelry trends are based on a collection of viewpoints online (from yahoo to squidoo and several others in between). Apparently the tiara is a fashion trend that is picking up speed (as suggested by a yahoo writer); I'd like to suggest that you forget the tiara (unless you're 8 years old) and go for . 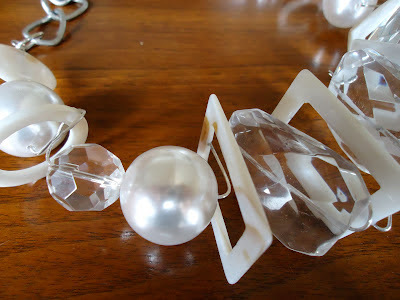 . .
Sterling connects faux elements and clear quartz into a chunky choker necklace. 1 The Chunky Choker Necklace - it is not a "choker" in the true sense of the definition, that which wraps around your neck, but rather one that sits higher on the collarbones. 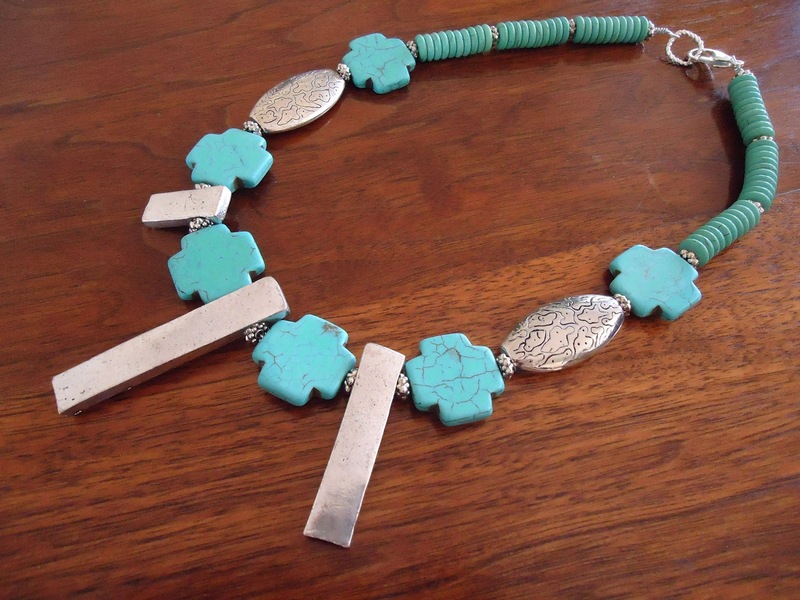 Oversized round turquoise beads form the basis for this choker. 2 Blue - choose semi-precious stones from turquoise to deep dark azure. 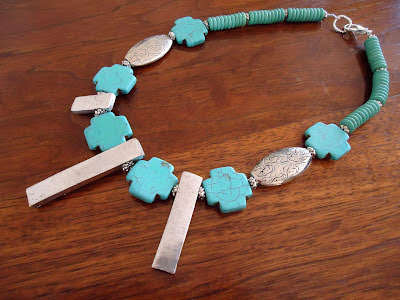 Turquoise cross beads form the base of this choker featuring Italian silver. 3 Crosses - were introduced in the Spring of 2012 but will gain momentum as we move to the fall. And so you have here the chunky choker necklace with turquoise crosses. Of course, this is an interpretation of how one might bring together two of the trendy elements into a signature piece that could be worn for more than one season. The asymmetry in this choker makes it just a little edgy as it sits on your collarbone. Byzantine cross pendant with black onyx. 4 Stacking - bangles, bracelets, cuffs and watch bracelets is particularly "in" for the summer of 2012. For a summer colour "pop", add white or some bright colours to your black, brown and metallics for a variety of colourful and metallic mixes, contrasts, and matches. 5 Feathers? - some (ie. at least two Squidoo contributors) are saying feathers are all the rage for the summer and fall of 2012; while others (ie. Huffington Post) are saying they are done. The feather craze began in the spring of 2011 and reached its peak in the fall and winter. The celebrity types, such as Gwyneth Paltrow, have now abandoned feather earrings so that may be our first clue. The spring and summer of 2012 saw a decline in the display of feather earrings in the shops so I can't see how they are going to bounce back for the fall. I'm speculating that those who got on the bandwagon late want to continue capitalizing on them or those who have hundreds in stock have to sell them; therefore the online promotion. But like shell jewelry bought on the beach, they are whimsical and can be abandoned after a short time of "frivolity and funnry". However, that being said . . . do you love them? . 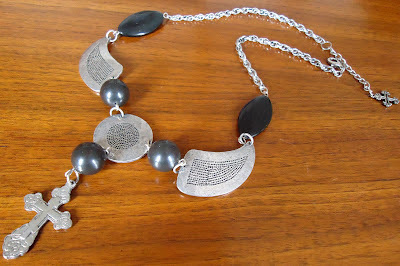 . . then continue wearing them.
. . . Necklaces featured on this post were made by JoyD. . . Hold back the urge to buy at the beach or in touristy spots, unless of course you are on Ponte Vecchio in Florence, Italy (famous for its jewellery shops). On those summer vacations at beach or seaside resorts, many of us have come home with earrings, necklaces and bracelets made of shells or braided raffia, yarn and ribbon. What possesses us to buy these poorly made tourist trinkets? When it comes to semi-precious stones, whenever you buy at a market or "on the beach" you do run the risk of buying "fake". Before you buy, take the stone and touch it to your cheek, if it is stone it will feel cool or even cold against your skin; if it is synthetic, it will be warm to the touch. You will undoubtedly come across jewellery makers in the markets and at summer exhibitions and shows. If you are traveling and see something you like but it is too long or too short, ask to have it altered to your specifications. For the most part it can be done, but perhaps not on the spot so be prepared to take it, if you love it, and have someone at home do it for you. But remember that may add as much cost as the finished product depending on the work. If someone tells you it cannot be lengthened or shortened, it usually means that it will be too laborious, perhaps needing to be re-strung. If it was handmade by the person, they can tell you exactly what needs to be done. I once had a vendor "shoo" me away and tell me I asked too many questions - she obviously was not the jewellery maker, although she was passing herself off as such. Great info, quite useful for my research. Thanks for sharing! I read your article. You share such nice description about different type of fashion jewellery with beautiful image of jewellery. You share such nice information about jewellery. Its too good. This is a helpful read for those who love to put on fashionable jewellery with their outfits. Looking forward to more posts. Thank you for your comment. I have transferred some of my academic habits to this blog even though I originally just wanted to write about something frivolous. What's in our closets is not so frivolous after all. 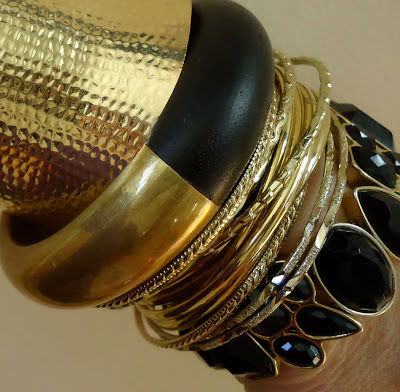 Amazing collection of fashion jewellery!! Thank you so much for sharing on this very nice and interesting info with us, I am sure your idea is more helpful for all to find for the best fashion jewellery. Designs are the most important thing in jewellery, because designs of jewellery define your personality. Jacknjewel recently launched thousands of unique and latest designs of diamond and gold jewellery which gives you a dynamic and attractive look.